Kungsleden today launches the Kista City cluster website, the second dedicated website that collects service information and inspiration for the company's tenants, residents and other partners in a specific Kungsleden cluster. The site kungsleden.se/kista is a way for Kungsleden to engage with tenants and prospective customers by being a hub of valuable services and information in Kista. The new site provides services, information and inspiration. For example, real time information is provided on traffic conditions, public transport departures and the next workout training session in the area. Additionally, suggestions are provided for lunch options and local events, as well as information on plans for the area, facts about Kista, where to find recycling facilities and charging stations for electric cars, etc. “The website is a way for us to communicate with our tenants. We hope it will become a natural platform for our current and future customers, where they can find vacant properties, and get to know more about us and our properties and facilities in the area,” says Diana Eriksson, Kungsleden's Asset Manager in Kista. The site will be updated regularly with new content from both tenants and Kungsleden, to provide an updated picture of what Kista has to offer. 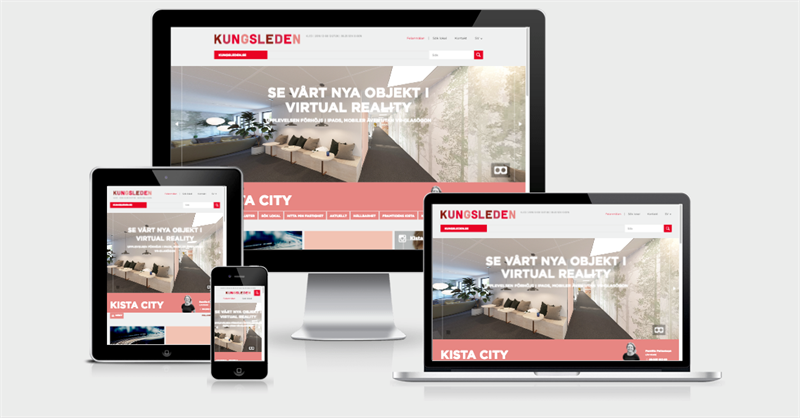 The site also provides Virtual Reality tours of Kungsleden's premises in Kista. “This is a way for us to continue to work with our principal approach – our cluster strategy. Amongst other things, the strategy contributes to effective property management, good local knowledge, and our ability to understand and meet the needs of our existing and prospective customers. Our clusters are unique and our two current websites differ depending on what is relevant for each cluster. We also cooperate together with other local actors to create inviting, safe and enriching locations, regardless of the time of day,” says Marie Mannholt, Head of Communications and Marketing at Kungsleden. The website is Kungsleden’s second cluster site following the launch of Danderyd Office (www.danderydkontor.se) in December last year. The next cluster site in turn is Vasteras City, which is expected to be launched before midsummer. kungsleden.se/kista is part of kungsleden.se, and is based on the EPiServer CMS and has been developed by Kungsleden with Amandus Communication AB. The information was provided for public release on 18/4 2017 12.00 noon.